The ruined citadel at Les Baux de Provence is a UNESCO international heritage site. The village underneath is pretty old too! 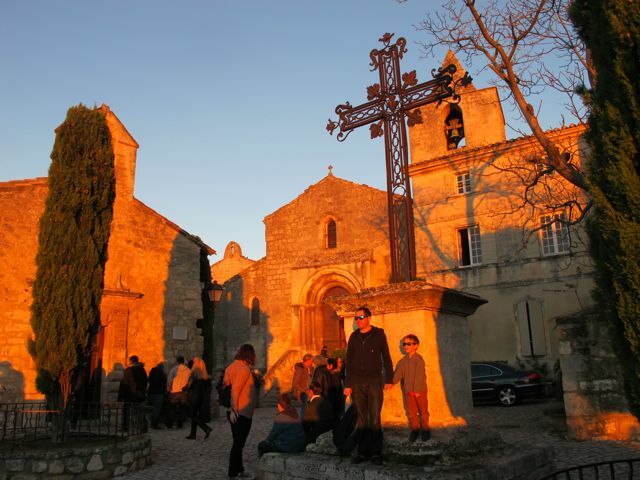 Les Baux de Provence ranks alongside Mont St Michel as one of the most visited places in France. On a clear day, the medieval castle on top of a rocky spur of mini mountain range Les Alpilles, boasts views to the sea some 30 miles to the south. Arles is the nearest large town and it was from here that we first visited Les Baux by bus in 1998. In 2000 we were staying in nearby St Remy de Provence and made the 15 minute journey over Les Alpilles to Les Baux by car. We pulled over with our picnic lunch and admired the silhouette of this most majestic of perched villages. All around there are hundreds of olive trees and vines. Last autumn we were in St Remy again and on an otherwise rainy day, took Ted up to Les Baux as the skies cleared before evening. I’m no longer as mountain goat fit as I would wish – indeed I remember sending Nick to the top of the citadel alone even when I was – and the towering sight of the village above where we’d parked our car was quite intimidating. Nevertheless, spurred on by memories and with Ted not so fast anyway, I managed the climb up some 200 or more steps to reach the village. It was quickly getting dark and Nick and Ted were admiring the sunset from this square. I was otherwise occupied with a street exhibition of photos about Princess Grace of Monaco. The Grimaldi family were once rulers of Les Baux and although the village is entirely administered by France, there remains a Monaco connection from one rocky outcrop to another. The Grimaldis donated stained glass windows to the main church in Les Baux and Prince Albert also holds the title Marquis des Baux. A series of venues around the village were displaying pictures from glossy magazine Paris Match telling the story of Grace Kelly’s arrival for the Cannes Film Festival and her subsequent meeting with and marriage to Prince Rainier in the late 1950s. Although she was Marquess, Grace’s only visit to Les Baux was in the summer of 1982. Life size colour pictures of the event were displayed outside in the same location and you could work out where she stood. She died in a car accident a few months later. I remember the funeral being televised with the young Princess Diana in attendance representing the Queen – I believe it was her first sole engagement overseas and a foreboding one at that. If you visit the cathedral in Monaco, you can walk past Princess Grace’s candlelit tomb adorned with roses. Les Baux today is tourist infested but still has an eerie air. Only a few dozen people live in the old village compared to 4000 at its peak. I can’t think of anywhere in the UK quite like it.